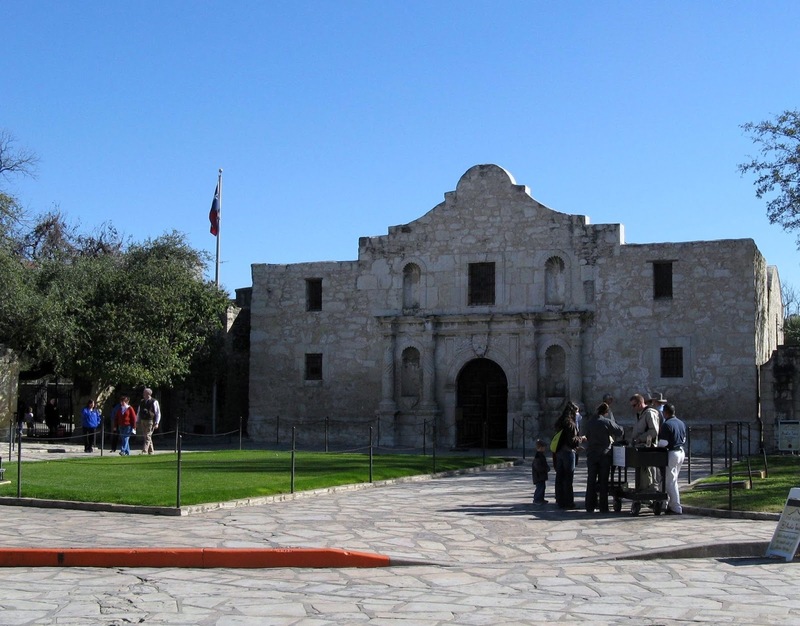 THE ALAMO: WORST OR BEST TEXAN ATTRACTION? The Alamo in San Antonio is Texas most visited attraction. Perusing the internet I came upon a listing of: "the worst tourist trap in every state." I was surprised at what the author felt were not worth a traveler's time or money. I had seen and written stories about most of his list that included Bourbon Street, Mall of America and Times Square. Was I out of contact with what's worth seeing? On the Alamo he said, "Remember the Alamo? More like, spend a day at the Alamo and you'll remember to never go back. The Building's remains are so small they consistently disappoint visitors." Given the fact there have been at least 14 movies about the battle in 1836, would suggest it has played a major role in American's opinion about its importance. The 13 day lost battle became the battle cry, "Remember the Alamo," that pulled Texans together to win independence from Mexico. After Texas joined the union there were disputes about borders of Mexico and the United States that gave President James Polk a basis for starting the Mexican-American war of 1846-1848 that enlarged our country "from sea to shining sea," adding seven states to our borders. With three million visitors a year from all over the world the Alamo is Texas's most visited attraction. Rather than getting a disappointed look we got a smile and then an emotional response to its significance to our country's history. 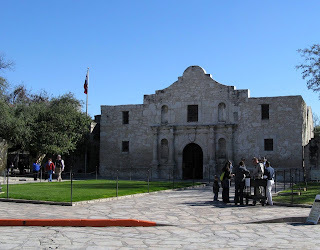 The Alamo has enough to see that it took us a full day to visit it and the surrounding exhibitions. In front of Alamo's plaza is a monument designed by Pompeo Coppini, an Italian sculptor who had adopted Texas as his home. Among the names of the Texans who died at the Alamo are William Travis, commander of the patriots and Jim Bowie and David Crockett. We took the audio tour of the Alamo area, stopping at 33 points that gave us a good overview of how the battle developed and the consequences. The Alamo itself, a former church or mission, is treated with a great deal of respect as a sanctified place. Men take their hats off, and no loud talking is allowed. Inside the building a docent explains carefully the course of the battle and the movements of the defenders. The memorial area includes a visitors’ center, a barracks and a small park. Throughout the area docents give information above and beyond the audio tour. Outside the barracks a man with some of the weapons used in the battle and other objects was discussing them with visitors. The barracks is filled with memorabilia and stories of what led up to the battle and what happened afterwards. Many of the comments on the audio tour focus on the maps, pictures and other displays in the barracks. Among the items are Fess Parker’s rifle, used in the movie where he plays Crockett, medical instruments used at the hospital, a large grinding wheel, and a ring that Travis, knowing that he was about to die, gave to a young girl before the battle. A 20-minute movie presents the story of the battle and its historical importance. Later at a nearby mall we went to an IMAX movie, ALAMO, The Price of Freedom, a docu-drama that recreates the battle scenes and heroism of the settlers who defended the Alamo against the Mexican army of Santa Anna. I feel the author of "the worst attractions list" failed to understand the importance to many of us travelers to be at a place where history happened and to see and touch those objects that played a role in creating the world we live in today. Texas is an exciting state for a traveler to visit since it has so many important sights to see. I have enjoyed doing stories on 22 of them. An Alamo monument designed by Pompeo Coppini with patriots Jim Bowie and David Crockett standing in the forefront.